A few weekends back we went to the store to pick out a new ceiling fan for Mr. Front Porch's office. 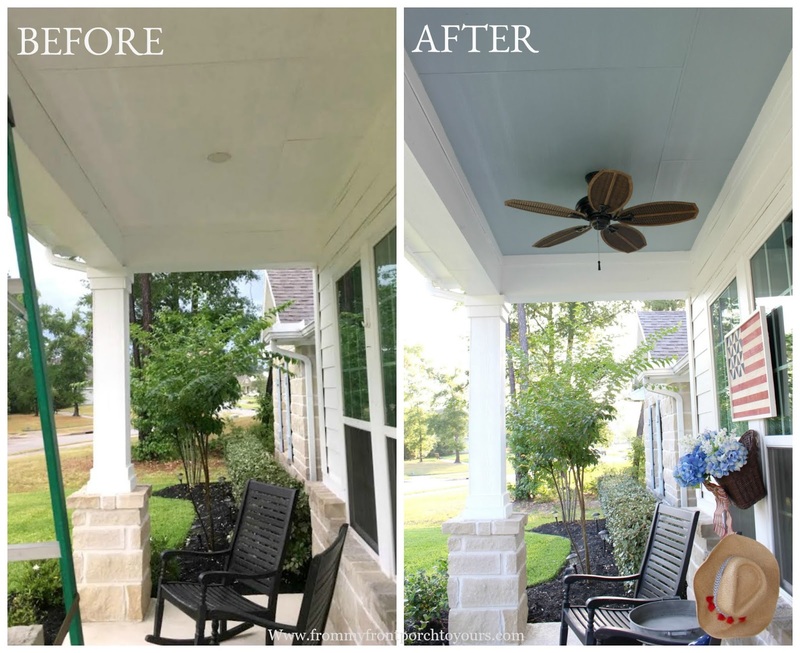 His ceiling fan was broken and since his office was getting a makeover it was time to replace it. 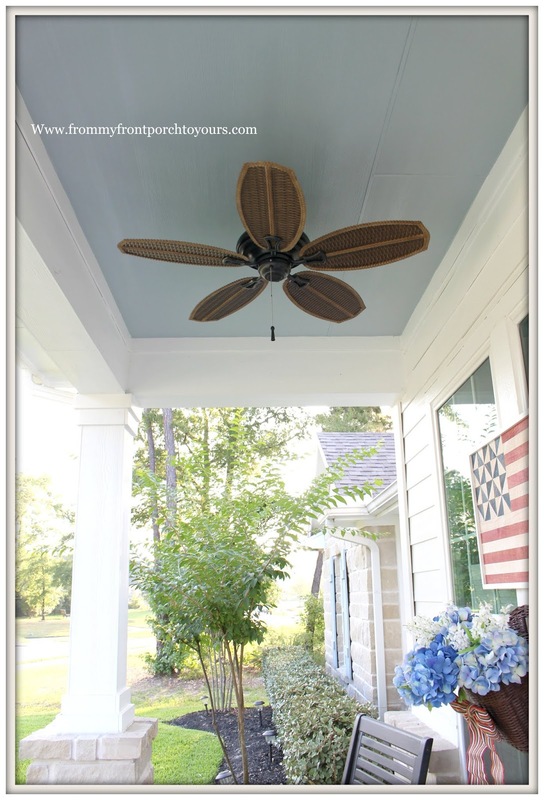 While we were picking out a new fan for the office we also picked up two fans for the front porch. 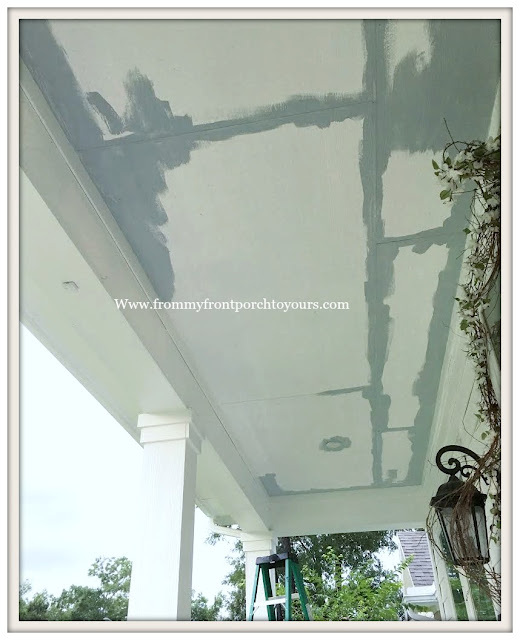 That started our porch ceiling makeover. Since we had already started on the office makeover I promised Mr. Front Porch that the porch ceiling makeover would not take long. I got right to work as soon as we got home. Ever since we moved in the plan was to plank the porch ceilings. That has not been high on our to do list so I decided I was not waiting any longer. The front porch ceiling was finally going blue! The blue paint is the same blue as our shutters and garage doors. We had the builder install the electrical for the ceiling fans back when we were building. We didn't care for their fans so we just had them cap the outlets off. I love the look of the fans out here! A little sneak peek of the patriotic decor. 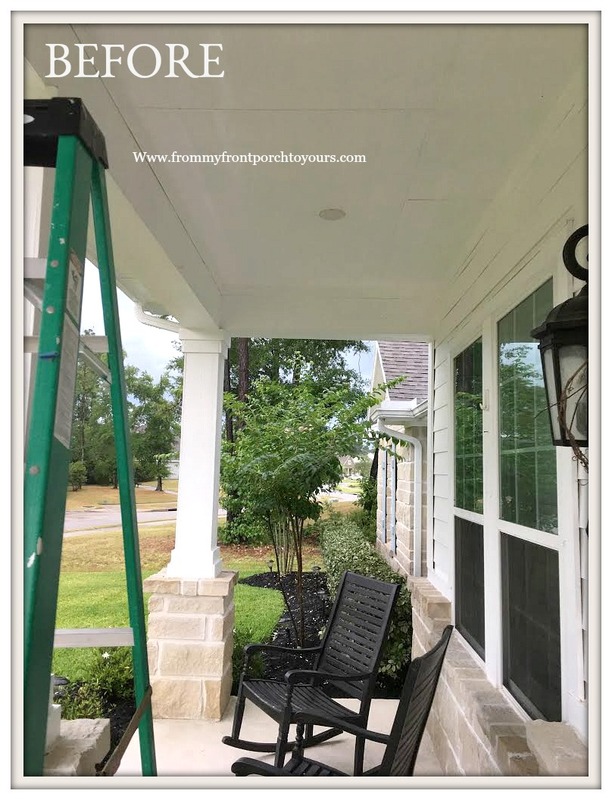 This makeover took one week to complete but in between I was still able to work on the office and I was able to redo the landscape in front of the house. It is amazing what a can of paint and LOTS of sweat equity in the summer heat can accomplish. We are already reading temps in the 100s! What is it like where y'all are? Thank you for stopping by to visit PattiLynn and your sweet comment. I love it, it looks so nice. Thanks Marty! Hope you are enjoying the weekend. I bet you are getting great use out of the pool. 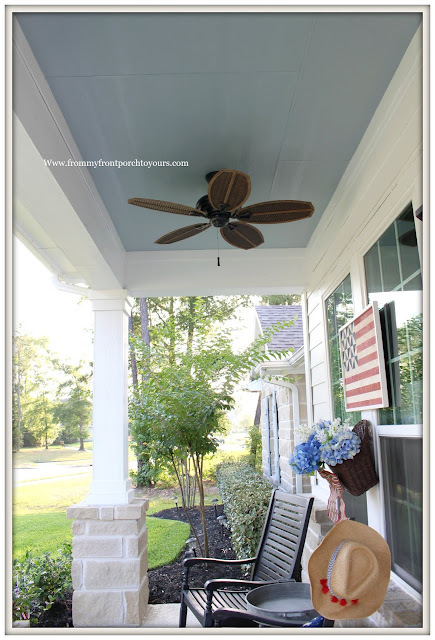 Love blue porch ceilings! Your porch looks wonderful. We are in the 80's here and sunny finally after all of our rain! Penny I am glad to hear the sun finally came out for y'all! It was another HOT day here but there is a storm coming in so hopefully it cool things off for the rest of the evening. Thanks for visiting and commenting my friend! Hi Debbie! To be honest I do not stand them very well especially with no longer having a pool but I am working on that one. LOL. Thanks for visiting. Hope you had a great weekend. Very nice. Love that color. Great job. 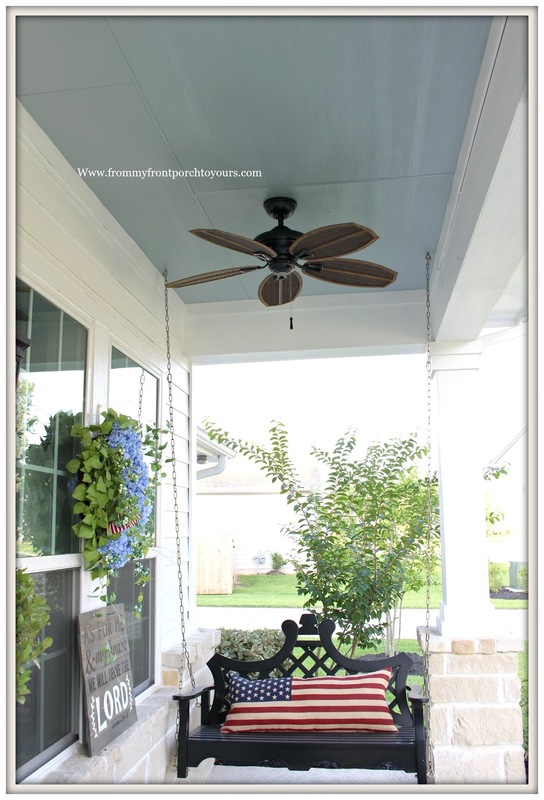 Love the blue and the ceiling fans will be nice to move some air so you can use the front porch. The blue really makes it and yes the fans do great in the evenings. Also helps to keep the bugs at bay. What a huge difference! Love the new fans.